Context: Wandered through the River Kior a number of times while reading this. As I read this, I couldn’t help wishing that it was, as the subtitle says, a story of tragedy and forgiveness. That finding her husband with an axe through his skull is tragic, there is no doubt. That she struggled to forgive is, at times, very apparent. 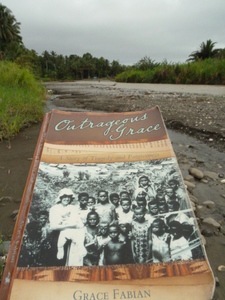 But for the most part, this is her story of life as a missionary and I found myself wading through pages of background info (e.g. Edmund’s mother fleeing from the Russians in Poland) just to try to continue with the axe murder mystery that takes place on p3. Because of the structure of the book, the tragedy made almost no impact on me. If I’d followed their lives and come to know them over a hundred pages of prose, perhaps I could have felt some of the impact. As it was, it felt unreal. In fairness, I suppose this is exactly how she must have felt at the time I guess. A white-collared kingfisher swooped down, landing on a branch of the pine tree just outside my office window. Equip us, by the presence of your Holy Spirit, for a powerful performance.